Photoshopped. Removed some of the damage. Feel like I took it too dark at the edges but did so to camouflage some of the intense damage that couldn’t be comfortably corrected without altering the photo. Susie’s dress was too damaged for me to comfortably correct without rebuilding it, which I am usually disinclined to do. 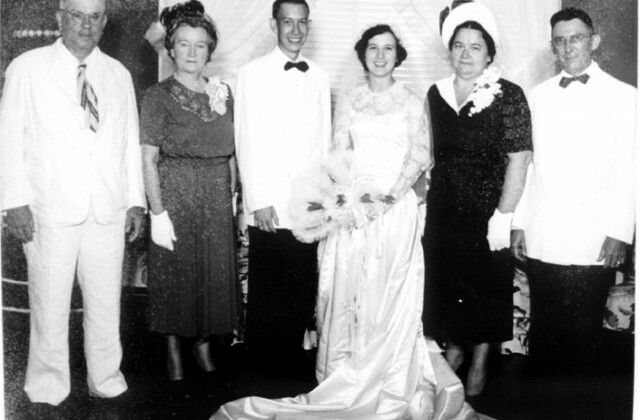 Jean Hennesy and Jack Kearns were married 1950 Aug 25 at the First Baptist Church of Mobile, Alabama. 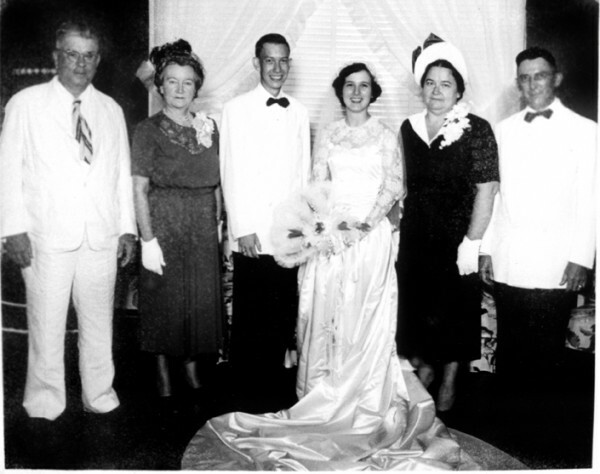 Shown in the photo are Martin Madison “Oscar” Drummond (Jack’s stepfather), Susie Crabtree Kearns Drummond (Jack’s mother), Jack and Jean Kearns, Ethel Hennesy Simmons (Jean’s mother), Esmond Edward Hennesy (Jean’s father).